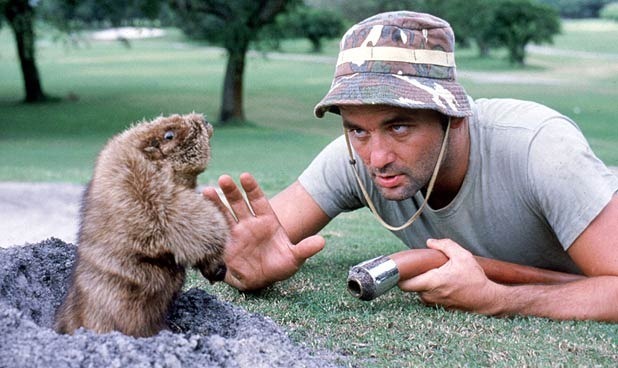 Long before “Caddyshack” in the eighties, gardeners and groundskeepers have had a fight on their hands when it came to getting rid of gophers in the garden. They’re persistent, they’re prolific and they’re tough to catch in the act. Before you resort to drastic measures though, there might just be a way to get the gophers away from your precious urban garden without blowing up the neighborhood. Longtime garden guru and one of my favorite television personalities Paul James recommends an unlikely item that uses something you might even have in the medicine cabinet. Castor Oil. I remember how much I detested the stuff as a child and apparently, so do gophers, moles and several other urban garden pests (even armadillos!). In fact, the scent alone is apparently enough to send the pests scurrying. Castor oil granules are made using castor oil, soap and powdered corn cobs, so all of the ingredients are natural and won’t harm the gopher or your plants. You won’t be poisoning the soil and risking the lives of your pets either. If you have holes and mounds in your yard but your garden plants are intact, you have moles, not gophers. Moles don’t eat your plants. Castor oil granules are spread on the entire ground surface area (including garden beds if they are affected) either by hand or using a broadcast spreader. Whichever method you use, you’ll just want to ensure even coverage of the amount specific on the label for the specific product you purchase. If you’re looking for other options to get rid of the gophers in your garden, you might consider live traps, which have a good success rate when properly used. While you could use lethal traps, we don’t recommend them. Got questions or want to share your successes and failures with garden pest control? Let us know in the comments below. I wanted to comment on the picture of this article. It is awesome! Some of us may not know the movie very well, but if you do, it makes total sense. Their is tons of people that experience this problem everyday, me being one of these people. I can’t tell you how many times I felt like Bill Murray and wanted to just blow up my whole property. I will say before I had the chance to use CINCH Traps to get rid of my gophers. I had tried many methods. The water hose, chewing gum, exhaust fumes, gasers and some other traps. I will say it was time consuming and frustrating knowing the gophers kept coming back. I used the CINCH Traps and now my yard looks normal again. I just wanted to share my experiences. Thank you. Previous post: Winner of Chef Apron Giveaway Announced!